Contrabandista is the title of Mexican tenor Javier Camarena’s new CD. It’s built around the career of the Spanish singer, composer, teacher, and general all around handyman Manuel Garcia (1775-1832). Of the 10 selections on this disc, five are by Garcia. He is better known as the first Almaviva in Rossini’s The Barber of Seville as well as for his performances of other Rossini operas. He was also a close friend of the composer. His three children were even more remarkable than the father. His elder daughter was Maria Malibran (1808-36). During her 28 years she was as celebrated a mezzo soprano as has yet to appear. She was also a friend and of Rossini who thought her supreme among his interpreters. The second daughter Pauline Viardot (1821-1910) was also a mezzo and was even more accomplished, if that’s possible, than her sister. She was fluent in every important language of her milieu and friendly with every artistic talent who passed through Paris. The son, also Manuel Garcia 1805-1906), became famous as a pedagogue after abandoning an indifferent career as a baritone. He invented a laryngoscope which he used as an aid in his teaching of singing rather than as a medical device. Nevertheless, he was awarded an honorary MD degree by the University of Königsberg. There are 10 tracks on this disc. Five of them are given to music written by Garcia. The second of these ‘Yo que soy contrabandista’ (I am a smuggler) is from his monologue for tenor El poeta calculista written in 1804. It is the only composition by Garcia to endure and gives its name to the album. The are four pieces by Rossini including ‘Principessa, sei tu…Amor…Possente nome’ a duet from Amida. Cecilia Bartoli is his partner here. 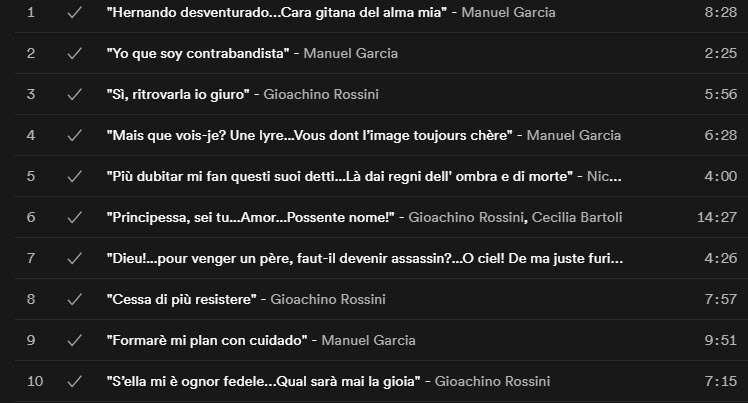 The 10th excerpt (number 5 on the disc) is ‘Più dubitar mi fan questi suoi detti…Là dai regni dell’ ombra e di morte’ from Nicolò Antonio Zingarelli’s Giulietta e Romeo. It’s a piece of vocal athleticism. That’s the only reason I can offer for its inclusion.